Many people have already asked me who is my first choice for United States president in 2016. At this point I don’t have a first choice because I like different aspects of many candidates. However, it’s true that I have somewhat of a “top five” I think would make the best and most elect able nominees. I put Donald Trump in that group. With all his short-comings, many of you might ask why? He’s the polar opposite of Barack Obama, Hillary Clinton, Joe Biden, Mitch McConnell and John Boehner. And, right now, there is nobody blowing a bigger trumpet for change in America than Donald Trump. He is doing it is a way that is deeply resonating with the American public. He’s bold and honest, not timid and deceptive in his use of words. He’s not beholden to the Washington, D.C. establishment (both Democrat and Republican). They are completely failing us and the American people know it and are fed up. He doesn’t care about political correctness. In other words, he not afraid of the secular progressive speech machine that intimidates many politicians into apologies or silence. He’s strong against terrorism and other forms of evil. He won’t “lead from behind,” in fighting ISIS. He loves America’s exceptional heritage and speaks boldly about reviving it. He knows how to create jobs and get people off the government dole. His resume is one of success and great accomplishment over a lifetime. He strongly supports our military and domestic police. There is one area where our current president and Donald Trump are alike–their message of hope and change. However, they have radically opposite views of what brings hope and what they want to change. Barack Obama has been somewhat successful in changing America into a weaker, secular, government dependent state. He thought hope would come from becoming more like the social democracies of Europe and limiting our influence around the world. Donald’s Trump’s hope and change is the exact opposite. He wants to renew traditional values, unleash American free enterprise, shrink the Nanny State, and rebuild our military forces to be a force for good against evil. His boldest and clearest difference with our current president–and the thing that has catapulted him to the top of the polls–is his strong, honest, position on immigration. 1. Build a wall on the southern border. A nation without borders is like a house without doors and windows. 2. Force all employers in this nation to use E-verify in their hiring (no cheating for cheap labor). 3. Don’t give citizenship to babies born to illegals (like all European nations). Either amend or clarify the 14th Amendment. 4. Deport those who entered illegally. 5. Make them go to the back of the line of those who want to legally emigrate to the United States. Simple. Bold. Common sense. We haven’t been getting much of that in Washington, D.C. for many years. Charles Hurt of the Washington Times captures the essence of the Trump surge in the following article which I will print in its entirety. That giant sucking sound you hear right now is the entire political establishment reacting in shock to Donald Trump’s deeply informed and comprehensive plan to address the rampant illegal immigration that has plagued America for more than a quarter century. In his first real foray into policy specifics, Mr. Trump took on the single most insanely and absurdly broken part of the entire federal government: the refusal of politicians to recognize that America has borders. As with every civilized country in the world, we have laws and we have borders. Yet American politicians in both parties have conspired for years to ignore all of them. As a result, American workers and the poor have suffered the punishing full force of depressed wages and vanished jobs. The only winners are illegals from other countries, big corporations and wealthy people who only like the illegals for the paltry wages they require, and the Democratic Party that hopes to turn these poor servants into loyal welfare voters. So Mr. Trump offers up a very simple, yet politically sophisticated, set of proposals for finally ending this insanity on the border. Many of his proposals are not new. They are the best ideas that have percolated up ever since the last Great Amnesty was granted in 1986, promising to end illegal immigration once and for all. Now, 12 million-plus illegals and three decades later, we are far worse off than we were, thanks to the insipid spinelessness of all stripes of professional politicians. What makes Mr. Trump’s immigration platform new and important is that in addition to having the right approach, he has the guts and vision and imagination and energy to actually force this platform back into the mainstream of politics where it belongs. Right now, please take note, it is all anyone is talking about. In fairness to the millions and millions of people around the world who are waiting to immigrate legally into the USA, these illegals would be required to go home and get in line. How is this proposal anything other than the very face of fairness? Of course, if you were a career criminal or a welfare case when you were living illegally in the USA, you probably are not going to be allowed back in. Good. One of the most maddening failures of the professional politicians is their steadfast refusal to build a damned wall along the Mexican border. Suddenly, they get all worried about wasting our money. This is idiotic nonsense. We could have built the Great Wall of China from the Pacific Ocean to the Gulf of Mexico and back again just on what these clowns waste on junkets in Vegas for bureaucrats. And then they insist it won’t work. Well, funny. The thousands and thousands and thousands of miles of concrete walls they build along freeways to keep the noise out of neighborhoods seem to work just fine. Sure, somebody might tunnel underneath, but that’s what Border Patrol is for. And at the very least, it will hamper the constant flow across wide-open deserts. Mr. Trump also understands that no border fence in the world works without increased interior enforcement, efficient deportations and stiffened penalties for overstaying visas. Most importantly, his proposal would finally drop the hammer on illegal workers and the businesses that hire them by finally making the federal e-Verify citizenship database mandatory for all hires. Mr. Trump has already proved himself to be the most entertaining, imaginative and visionary candidate running for the Republican nomination. 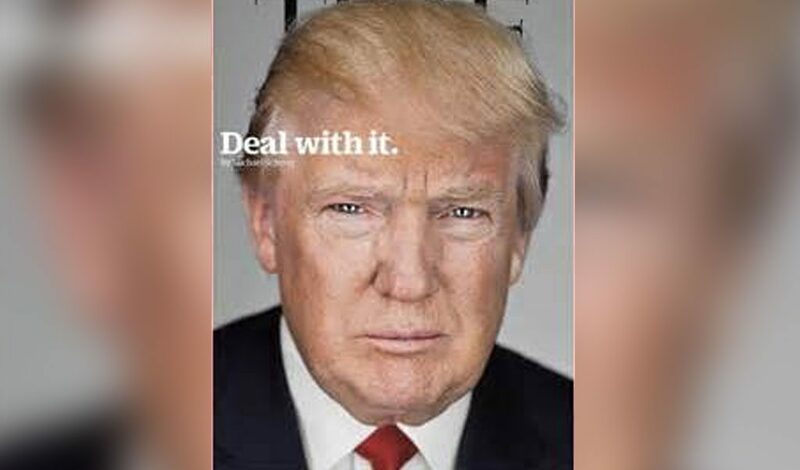 Now, he has proven an ability to quickly grasp a complex problem that has bedeviled politicians for decades and come up with a winning, principled solution. If this is a harbinger of Mr. Trump’s plans to come, there may be no stopping him now and America really just might be made great again. When you’re being eaten alive by the Philistines, maybe it’s time to look for a Samson-like leader–despite the flaws. That’s why Trump is resonating.